The Legislature of American Samoa or Fono is the territorial legislature of American Samoa. Like most state and territorial legislatures of the United States, it is a bicameral legislature with a House of Representatives and a Senate. The legislature is located in Fagatogo along Pago Pago harbor. It is the only legislature on the state or territorial level in the United States that is both bicameral and nonpartisan. The Nebraska Legislature is similarly nonpartisan yet is a unicameral body. The lower House of Representatives has 21 members, elected for a two-year term. It comprises 20 single-seat constituencies and one constituency decided upon by a public meeting on Swains Island. The Senate has 18 members, elected for a four-year term by and from the chiefs of the islands. 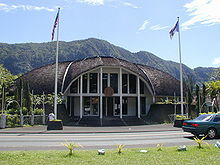 The American Samoa Fono is housed at the Maota Fono complex, a bee-hive shaped building based on the traditional Samoan fale. It is based on the same traditional building designs as the Fono in Samoa. A two-story main wing (housing the Legislature's and Governor's offices) is flanked by two single-story wings housing the chambers from the Senate and the House of Representatives. This Fono building is the second to be located in Fagotogo and opened in 1973. The first Fono was housed in the former home at the United States Navy Tutuila Station barracks. It was destroyed by a fire in 1970. The former Fono site is home to the ANZ Amerika Samoa Bank's Head Office. ^ Sunia, Fofó Iosefa Fiti (1998). The Story of the Legislature of American Samoa. American Samoa: American Samoa Fono. p. 68. ISBN 982-9008-01-0. Retrieved 17 May 2010.